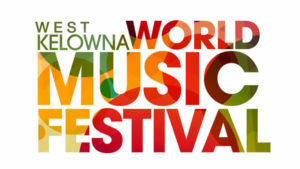 Held annually in late August, the West Kelowna World Music Festival celebrates the cultural diversity of the community, through music, food and activities. The focus of the festival is the cultural diversity of West Kelowna and connection to cultural expression from around the world. 2018 Line-up will be announced later this spring! Chipko Jones is a Calypso/Roots/Reggae band based in the beautiful Okanagan region in BC, Canada. The project was formed in 2014 and includes members Anessa Lang and Darius Stone/Sax, Moot Murphy/Vox and guitar, Jen Millan and Jacob Soucy/Trumpet, Jacob Chatterton and Tim Osborne/Bass, Wendy Aronyk/Flute, Waseem Hakhroo and Chris Galardo/Drums and Bruce Collis on Conga and percussion. All the members met through the thriving music scene in the band’s hometown of Vernon BC. Singer/Songwriter Kym Gouchie is from the Lheidli T’enneh Nation in Prince George, BC. Canada. A self taught guitar player and a traditional hand drummer, she utilizes her eclectic background to inspire her as she combines elements of traditional, folk and country to create a unique voice. Raised among musicians, it wasn’t until dealing with personal tragedy that she was able to find her voice on her own journey, which is realized with her debut album. Led by Juan Clemente, the four piece local band Los Riveras plays music from traditions of Latin, Spanish Flamenco, Romani, and Gypsy. The band will have flamenco dancers with them. Get ready to dance with them! Waking Calliope is a singer/songwriting duo from British Columbia Canada consisting of Bex Troock & Joshua Smith. They describe their sound as Canadiana Dream Folk. The Oot n’ Oots- www.theootnoots.com – Last minute addition! Western Canadian Music Award-nominated The Oot n’ Oots are a rock band for kids, full of eclectic twists and turns, ripping guitar solos, comedy, and heart. Krystal is a First Nations drummer and performer from the Westbank First Nation. The Interior Savings KidZone is back in 2017. Interactive music and culture sessions will be taking place between 4 -8 pm on Saturday, Aug. 26, for kids, caregivers, and even the young at heart! First Nations story interactive telling, with costumes! Circus Yoga Kelowna with mindful fun including human pyramids, hoola hoops! Creative Okanagan has partnered with the Suk’ʷtəmsqilxʷ West Kelowna Arts Council, the Arts Council of the Central Okanagan and the Rotary Club of Westbank to present a public art instillation at the West Kelowna World Music Festival in 2017.